DIN Standards are issued for a variety of components including industrial fasteners as DIN 7516 Self-Tapping Screws or Thread-Cutting Screws. DIN 7516 Screws are manufactured from stainless steel Grade A2 and A4, Brass, Alloy Steel or many other materials. DIN 7516 Screws are available in a wide range of sizes, shapes and materials. DIN 7516 Self-Tapping Screws forms A, D, E with a cross shaped slot. Complies GOST 10619-80, GOST 10620-80 and GOST 10621-80. Flat Countersunk Head Cross Recessed (Philips) Drive thread cutting screws. 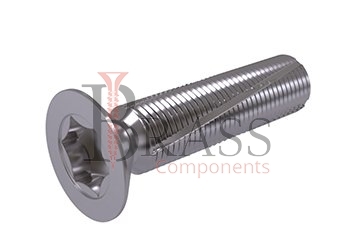 Self-Tapping Screws with blunted tip and specialized grooves in their threads that are designed to help remove material from pilot hole in the substrate. Zinc Coating increase the service life of DIN 7516 Screws in conditions of high humidity, thereby protecting the screw from corrosion of the metal. The grooves on the screw enhances the ability of the DIN 7516 flat countersunk head cross recessed (Phillips) drive thread cutting screws to tap its own thread. 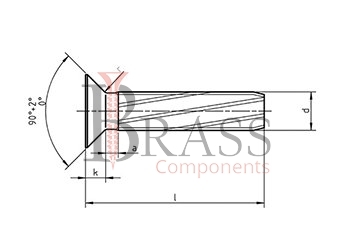 The ideal diameter of the pilot hole should be determined on the basis of adequate testing. Flat Countersunk Heads have a flat top surface and a cone shaped bearing surface with a head angle of approximately 90°. The DIN 7516 Fasteners under consideration cut the threads themselves, which will be useful also when the required threaded hole is deformed and new threads need to be cut. A slightly smaller core pilot hole diameter can be used for thin walled substrates made from softer materials. Used for application where the head must be flush with the mating surface of the substrate. We manufacture DIN 7516 Screws as per Custom Specification and export in France, Italy, Switzerland, Poland, Greece, UK and other European Countries. For more Information, Please Contact Us or Inquiry Now.